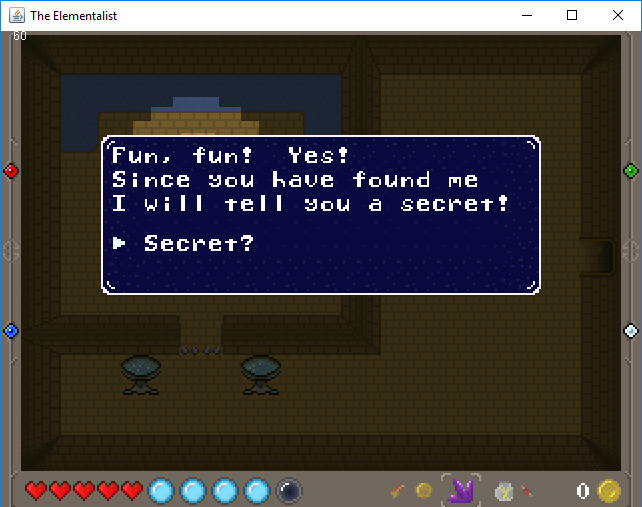 News, updates, art, code and ramblings about the upcoming 2D puzzle action RPG The Elementalist. There can be a lot going on when playing The Elementalist so coming up with an input scheme that makes controlling the wizard feel intuitive is important to me. Initially I simply implemented key bindings that seemed reasonable for testing (K.I.S.S.) but when I added in the ability to control the game with an Xbox 360 game pad it felt much more natural. I spent a fair amount of time play-testing the game with the 360 controller and getting pretty familiar with that setup. It was not until I added in the ability to configure key and mouse bindings in the game that the controller really had any competition. Now I think both are pretty intuitive after a little use and there are things I like about both schemes. Controlling with a game-pad does have a nice retro feel (although you will need more than A, B, start, and select) but the ability to navigate menus using the scroll-wheel also feels really natural to me. Hopefully one or the other will work well for you in the alpha, but I am definitely interested in feedback if there are things that can be improved. As you can see the keys are all organized around the standard WASD setup for movement with the element selections taking the 1-4 numerals and the ability to use items and grab props close at hand. While attack, defense and item selection and use are bound to keys I find the use of the mouse much more intuitive personally (though if you run in windowed mode and move the mouse out of the window that can be surprising -- luckily there are plenty of display settings that can make this a non-issue). There are also a few other bindings that I did not call out in the image here, specifically the arrow keys always function within the UI, the Enter key always means "yes" within the UI (as does the left mouse button), and the Escape key always means "no" or back within the UI (as does the right mouse button). The full set of key bindings can be viewed and changed to whatever you desire, though a few defaults cannot be changed to prevent you from making an unusable setup (specifically the arrow keys, enter, and escape always function to control the UI). The Xbox 360 controller has been on my desk next to my computer for quite a few years and gotten a fair amount of use in various titles where I felt it just felt right (Witcher 3 I'm looking at you!). In any case I wanted to be able to use it in The Elementalist and am happy to say that it works great (for me at least!). Making a UI for binding controls for it seemed a bit like over-kill for the alpha but I did make three profiles that can be selected from in order to hopefully cater to personal preferences. The image above shows my personal favorite, which is the default setting (note that the little gray arrow in circle bits imply pressing the right or left stick -- given the pixel limitations I'm working with that was the best I could come up with on short notice). There is also a version that uses the Directional Pad for moving for those who really prefer it that way. If you play around and have a strong desire for an alternate setup let me know, it could even sneak into the game! Now to get back to work testing the content! An action game lives and dies (sometimes literally) by it's enemies. The Elementalist blends action, puzzles, and exploration so having a good cast of baddies to practice all those cool spells against is a must. Suffice it to say I have put a lot of time and effort into making the enemies that our wizard will face. Every enemy in the Elementalist has a distinct AI that drives it's behaviors. Each individual AI is directed by a set of motivations that can be predicated on the conditions present in their environment and the ability of the enemy to detect them. More simply stated the enemies decide what looks tastiest moment to moment and drool accordingly! Enemies also have the ability to react to events occurring around them and navigate their way around the map with varying levels of sophistication depending on how clever they are. Some enemies fire projectiles back at the wizard and have custom intelligence that determines how accurately they can aim. I quickly realized that making their aim too accurate made things a little too challenging (and made the wizard a bit too much of a pin-cushion). All of these custom behaviors are still being tweaked and adjusted as I play and re-play the alpha content, but I am excited to get your feedback to really dial them in. Along with their custom AI all enemies also have a set of strengths and weaknesses that dictate what kinds of attacks work best to overcome them. Hopefully they are mostly intuitive (and helped out by the floating damage numbers) but I do expect players to experiment and find new strategies where all else fails (and it will probably fail at some point). Defeating enemies will add an entry into the wizard's "Bestiary", which can be accessed from the in-game pause menu. Defeating multiple enemies of the same type will reveal more information about the enemy, including the strengths, weaknesses, and hit-points (HPs!) of each. Be sure to check your Bestiary after whacking a new fiend! A classic that keeps coming back for more (provided there are still limbs, bits, or brains available). Zombies use their keen sense of smell and reasonably good vision to hone in on the most delicious treats available. What the zombie lacks in brains it definitely tries to make up for (by eating yours). Yes, the zombie really loves that meat... hmmm, could that be a hint? No, probably not; hints here would be inconceivable! The Rattus are scattered hither and yon about the world (that's just the vernacular you have use for role playing games, sorry). The Rattus soldier employs it's exceptional mobility to dodge incoming attacks and get it's pointy bits where you don't want them. Make sure you can walk tomorrow by keeping this feller at range! There are roughly a dozen enemies currently in the alpha contentout of the currently completed set of twenty-eight. I have also created art assets for another half-dozen or so and have a few more designs in mind. I expect the full enemy roster to be in the neighborhood of fifty when the game is complete but in the mean time I hope my first dirty dozen can keep you occupied! Most of the alpha content is complete and I am just adding a few visual, auditory, game-play and interface tweaks as I go through the content over and over (and over). My hope is to get things ready for alpha release right around Christmas. Yule never expect it! (ouch! sorry). I spent some time this evening working on NPC dialogs for a few of the merchants in the game introducing some of their side-quests. The base content for the alpha is getting close to completion and I am still trying to find that sweet spot where I can feel like there is enough included to get a feel for what the game is and enough alluded to that you can imagine the greater context and hopefully be excited to explore the rest. All of which has very little to do with the rest of the post, which is about the other usable items I did not get to in my previous post because I agonize over all the content I produce, even for the Internet (reading what you type more than once? Shocking, I know). This muddy brew may take second place in a beauty pageant(*) but it still grants the wizard temporary immunity to damage. The damage immunity may not last a long time but it can sure be a life saver (or possibly a puzzle complexity reducer for the impatient)! When your enemies have more legs than brains this simple combination of rope and rocks should be your go to accessory. What it lacks in, well, everything else, the bolo makes up for in it's ability to slow your enemies down. Far less addictive than you might expect, this potion never-the-less gives you a serious kick in the movement department. It will let you win at things you aren't even supposed to win at, like yelling. You will win at yelling! Or maybe something else like jumping or waving. It will let you wave your hands really fast and you'll probably become invisible! Which doesn't even make any sense! * Just quaff and go! Go go go go go! The "Large" potion. It's like if your mana potion and your healing potion got together and had a very big baby. And then you drank it. On second thought, let's leave the metaphors out of this. If you came to chew bubble gum and kick tail but you are all out of bubble gum(*), try the invincibility potion! "Wait, how is this different from the Bark-skin potion?" you may ask. Simple, the Bark-skin potion only prevents direct damage to you, it won't prevent all of the other unfortunate status effects that might happen, like being hexed, knocked back, slowed down, stunned, etc. If those don't sound appealing maybe this will! The lucky coin makes all your coins lucky! In practice this means that if you toss out a coin while you have this shiny fella equipped it will work like some kind of secret sonar and "ping" for any nearby secrets. Just look for the sparkles! Do you feel lucky, punk? * Don't complain, it's cheaper than bombing every square inch of wall like you had to do in the original Zelda. And these days if you're a real cheap-skate you can probably find all the secrets on-line anyway; way to ruin everything Internet! Don't let Dumbledore(*) know where you got this. If you have a phoenix feather equipped when you die you will be immediately reborn in a burst of flames, though you can safely assume the feather bit the dust in the process. Just don't count on this to save you if you fall into an endless pit or a puddle. Alright, that wraps up the currently implemented usable items in the game. The wizard can also improve their chances of success by finding more powerful gear through searching out secrets and fulfilling quests for some of the world's inhabitants. Thanks to all you LeVar Burton* fans for getting this far! Keep your eyes peeled for more! And if you know anybody else who might enjoy having their eyes peeled point them this-a-way (it sounds odd but there are actually a surprising number of people who enjoy all kinds of crazy stuff out there if the Internet is to be believed)! 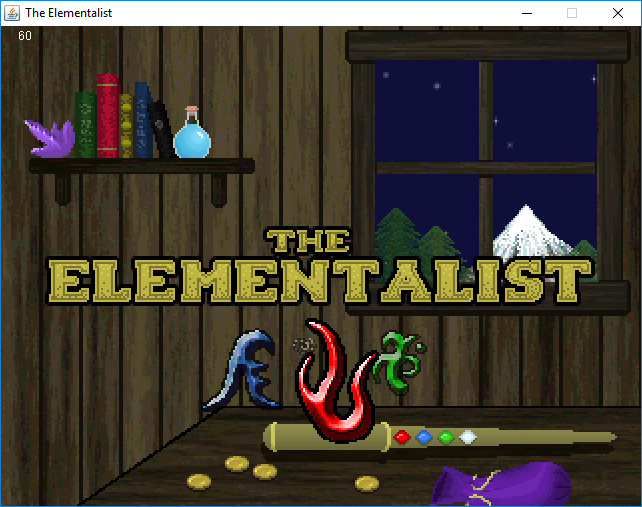 Today I want to cover eight of the sixteen items currently in The Elementalist. The items here can be used in many different ways within the game. Most have a very obvious use but some can also be used to take the place of a potentially unknown spell or possibly to solve puzzles for which no other solution may be possible. The brief tutorial in the game includes a few examples of these cases but there are many more to discover throughout the world! Items can be obtained by defeating specific enemies, uncovering secret caches, or simply purchased from one of the world's NPCs (non-player characters for those too cool to be in on RPG, role-playing game, jargon -- though that probably narrows things down to the subset of people who would never in a million years be caught reading this blog so I guess I can forge on with geeky acronyms safely, huzzah!). Most items obtained can only be used once before they must be purchased again, though there are exceptions to this rule; for example your teleportation crystal is never used up and if you manage to put out your bomb before it explodes you can safely pick it back up (unless somebody else lights it again for you). Ok, I'm getting ahead of myself here; on with the first eight items in the list in no particular order! The teleport crystal is retrieved early on giving the wizard a means to return home at any time. As you explore the world the crystal can be attuned to larger crystals found throughout so that the wizard can be instantaneously transported around the open world. The teleport crystal can be used infinitely. The mana potion can be used to immediately replenish the wizard's current stores of mana, which otherwise recharge over time. When fighting tough adversaries being able to recharge your spells without delay can make all the difference. And mana potions are blueberry flavored to boot! Just like it says, this is a fairy in a jar. Fairy jars make for a great lantern in dark places and can be set on the ground to illuminate your surroundings. You can even pick them up and stuff them back in your belt to use them again. Just be careful that nothing breaks the jar because catching fairies that get loose can be tricky! We all know what sticks and stones are capable of. So why not see if you can't put them to good use? They also make a great impromptu remote operator of switches if you happen to find any of those (nudge, nudge, wink, wink). The quintessential fused fun bringer, bombs require a bit of finesse due to the delay between getting the party started and actual party time. If you (or one of your enemies) happen to extinguish the bomb before the party starts be sure to pick it back up for a rain-check. Pink is totally in; in to saving your back-side that is! Unlike mana, you do not periodically recover your health so keeping a supply of these little pink cuties on hand is definitely a good idea. The wizard is relatively frail and depends on staying out of the line of fire; but if the line should pay a visit just say hello to your little friend! You can also recover your health by resting at a bed, but beds are somewhat less portable. A hunk of meat may seem like a silly thing to keep in your pocketses but it can definitely be preferable to being gnawed on. Just be aware that once you flop this down there's no picking it back up, ten second rule or no. A vial of holy water just destined to ruin the day of some poor undead thing assuming your aim is up to the task. Water fight anyone?! This playful beauty snaps shut on your enemies (or yourself if you aren't careful!) and will hold whatever it has snapped on in place for a few precious seconds, giving you the chance to escape or make some other daring move! You were planning to do something daring, right? That wraps up the first randomly selected half of the items currently in The Elementalist. Stay tuned for the remaining eight items in a future post! Today's post focuses on the "strong" elemental spells that the wizard attains when he retrieves the second gem for an element. "Strong" spells require the wizard to build up elemental power before casting so timing is important, though the wizard can still move at a somewhat reduced rate while channeling an element. These secondary spells add some of the heaviest damage attacks as well as the four elemental forms which provide incredible utility. The aptly named big fireball makes a lasting impression. On impact it detonates sending smaller fireballs in every direction so you can be sure there is plenty for everyone. Luckily your bonus fireballs don't hurt you! Take on the elemental form of fire and blaze your own trail (literally)! In fire elemental form you can move faster than ever before and can pass through flames without being hurt. Plus you leave a fiery mess behind you and who wouldn't want that? Take on the elemental form of water and go with the flow! 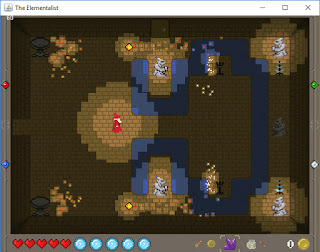 In water elemental form you can walk on water and you leave an icy trail behind to slow your foes. Just be sure you make it back to dry land before you take an unintended dip in the deep! The stone fist hits like a bomb and will send all but the toughest of foes sailing back! As an added bonus it can smash through some walls and make ice blocks into a million ice cubes. Now you have a reason to yell: "Stand back, I'm making daiquiris"! When the going gets tough you may need to get tougher. Like rock tough. In earth elemental form you can walk through anything, which can be like, super handy sometimes. Unleash the storm with chain lightning. When chain lightning hits something it forks, and when that lightning hits something it forks, and when that lightning hits something it forks, and.. well, then it pretty much stops. But that is still a lot of forking lightning.. When you absolutely have to get over that giant chasm today air elemental form is your go to spell. Become a happy little cloud and float away like you always wanted to. Just remember you stop floating when the elemental form expires. That wraps up our tour of the "strong" elemental spells. Be sure to check out the standard elemental spells in the last post if you missed it. Of course all of this is subject to minor revision as we go but for the most part I think the sixteen elemental spells are pretty much ready for puzzle solving and enemy defeating. Cheers! The titular Elementalist is a wizard who specializes in elemental magic; specifically the four primary elements: fire, water, earth and air. At the outset of the game the wizard has lost much of his power (I know, shock!) and must regain it by recovering the elemental gems for his wand. This gives players a chance to gain mastery of the game systems as they progress. For each of the four elements the wizard will eventually master four spells, bringing the total to sixteen eventually (not to mention the sixteen items currently implemented). This may sound overwhelming at first but it becomes elemental in no time (puns are always free)! The spells are somewhat loosely categorized as "offense" and "defense" and include both a "basic" and "strong" version. In order to cast the "strong" version the wizard must already have attained the second (and of course larger!) gem for the given element. Today I want to give a quick preview of the "basic" spells for the four elements. Very few spells are as basic and still satisfying as the old stand-by fireball. This no-frills spell is sure to leave your enemies hot under the collar and has the added benefit of lighting up some of the scenery in the process. Don't leave home without it. Bonfire may technically count as a "defensive" spell but don't let that fool you, some enemies really are stupid enough to walk right into this party. Bonfire can also pass through some semi-solid objects and be a Really Useful Engine Spell. Nobody knows who started the wave, but we can all agree that it is hard to stop once it gets going. This wave is good at putting out fires and pushing back the unwanted advances of shambling hordes who are all but putting a tic-tac in their mouths right now. For those about to rock. The simple rock ball attack is bound to be a hit with some of your enemies. Also useful for hitting those out-of-the way switches that seem to be all the rage for some reason. Erupting a stalagmite in front of you can be a handy way to stop incoming attacks or just make an obstacle for enemies interested in getting a bit too close. And if your timing is right there are plenty of enemies who will not appreciate it bursting out of the ground to meet them. Fast and furious (and amazingly rehashing the same tired formula over and over), the lightning bolt is capable of delivering a real jolt in a hurry. I know, shocking, right! A brief burst of wind to propel you quickly forward and potentially over small gaps. Wind gust really is the wind beneath your wings! Alright, that wraps up the overview of the eight basic elemental spells. If you are like me (god help you, I'm so sorry) you are already thinking of the many ways these could be used to overcome enemies and obstacles, solve puzzles, and generally infect your whole train of thought. 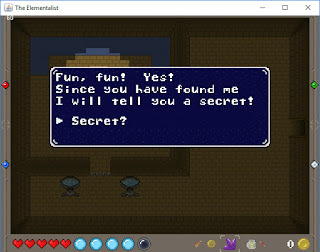 If not, I still hope you are intrigued and looking forward to seeing some of the "strong" elemental spells and additional items for the wizard to use. Several months ago when the sun was still shining over the streets of Northeast Portland I was showing the latest build of The Elementalist to one of my neighbors. It was our annual block party and I had promised the year before to show what I was working on and failed. So this year, with the kids a little older and able to fend for themselves somewhat I brought out my tablet and an XBOX 360 controller and was in the process of showing off. After playing through the intro sequence and seeing some of the later content and tools I have made to build the game my neighbor asked me the simple question: "so, what is your next milestone?" I really didn't have a good answer at the time. I have been working on The Elementalist for over six years. I have a Trello board to track my day-to-day work and ambition. I have sketchbooks, notebooks, papers, design docs, and other paraphernalia of my process scattered hither and yon across my desk, desktop and home to remind me of what I want this game to be. I have dozens of tabs in my favorite browser I don't dare close because they have some tool, tip, trick, or bit of arcane knowledge I know I might need to finally seal this project out of my consciousness for good. But for all the trees in this development process it can be hard to step back and see the forest. I began this project because I wanted to build a game that took the fundamental components that I love from the classic 2D games of my childhood and combined them with a dose of modern features into something original and yet familiar. The Legend of Zelda remains one of the most important games for me and I wanted to blend that recipe of mystery, exploration, and progression with more complex puzzle and combat mechanics. I wanted to make something that both my kids and I would want to play. I knew my protagonist would be a wizard almost right away. The combination of a relatively frail physical form with potent magical skills really fit my modus operandi and having a wide variety of abilities was a must for the puzzles that immediately started springing to mind. I began sketching right away and writing text documents describing what the game would need architecturally. It did not take long before I started my project under the inauspicious placeholder name "wizgame". I wanted the game to be a strict 2D presentation with discrete rooms in the vein of the original Legend of Zelda but to include dynamic lighting and to scale to any resolution gracefully. The first code I wrote was to prove out these specific design goals and once that was complete I knew I was ready to take the red pill and begin the real journey. This is not my first game project and having been a professional software engineer for many years and a manager of software teams I knew what I was biting off. I decided to start small. Literally. Once I knew I could make my UI scale seamlessly to fit any display the real question was what would I use for the native resolution? I decided to start with 320x240 since it gave a good pixel-y feel to the display and was a native 4:3 ratio. It sounds archaic and possibly masochistic but the truth is that it has been a really fun challenge to work at that scale (fun fact: the original NES ran at 256x240). Every time I fire up the game as I develop I compare it in my mind to the legacy that inspired me and I like to think it is on the right path. So, to get back to the original question, what is my next milestone? Getting a playable alpha into as many hands as possible and getting feedback. I have already started the Trello board with the last bit of "must-haves" for a public alpha and getting a blog up to discuss it with you all is another card that just got crossed off... just a few more to go. I am really looking forward to sharing the last part of this journey with you. (C) Zack Radick. Simple theme. Powered by Blogger.